I drive a 2008 VW Touareg with stock 17″ Pirelli P255/60R17 Scorpion STR tires. I noticed the VW recommended tire pressure was 2PSI higher than the tire’s maximum pressure rating. 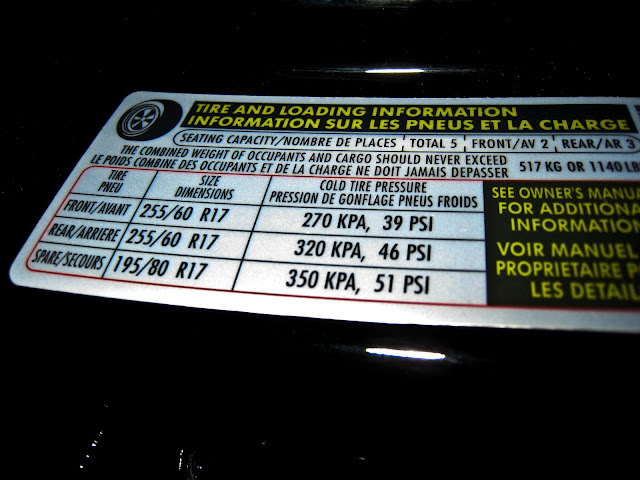 The tire pressure sticker on the driver door indicated 46PSI, while the tire wall indicated a maximum tire pressure of 44PSI. 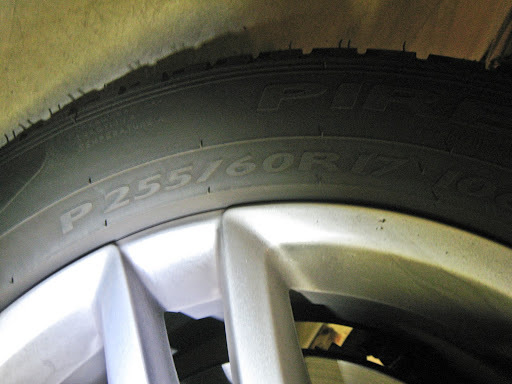 Overinflating tires is potentially very dangerous. I posted my findings on the Club Touareg Forum, and other owners of similar vehicles confirmed the same information on their tire labels. 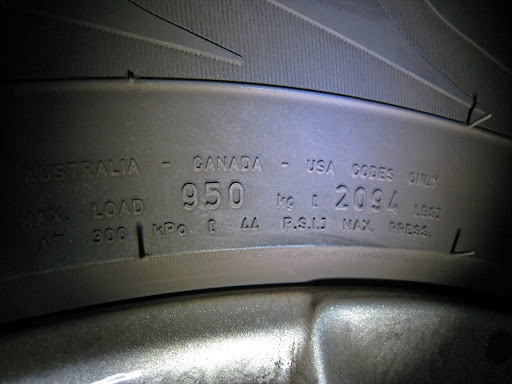 I opened a support case with VW USA asking what the correct recommended tire pressure is. VW’s said that the label is correct. I explained that the recommended pressure exceeds the maximum pressure, they said they would get back to me. After a few weeks I was contacted and told that I should use the recommended pressure as indicated on the tires. I explained that there is no recommended pressure indicated on the tires, just a maximum pressure, they said they would get back to me. After about a month I was contacted and told to inflate the tires to less than the maximum rating. Since I made no real progress with VW support, I contacted Pirelli, and they were much more helpful. conform to FMVSS 139 and ETRTO requirements. The table that references 950Kg for both 44PSI and for 51PSI still had me confused, so I called Pirelli directly. 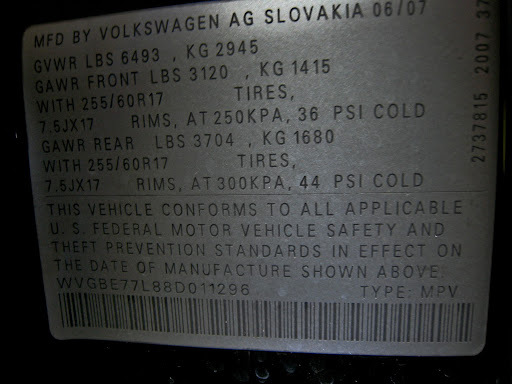 The person informed me that this is a known issue of the tires being mislabeled, and that VW should know about it. I was told that the correct maximum pressure of the tires are 51PSI, and that I should follow the recommended rating on the VW door sticker of 39PSI front and 46PSI rear. I have now moved all old archived content from my website to this blog, the old pages contain links to the equivalent blog postings. I know the copy-and-paste blog formatting is not very elegant, but it will do. I was using the standard Blogger “Tic-Tac” template, but the readable area was not wide enough to fit many of the images I embed in articles, and this would either skew the text, or cut of the images. I found an article with step-by-step instructions on how to widen the “Rounders” template, and I am now using a widened “Rounders 4” template. I don’t know why all the templates are fixed width, why not dynamically adjust the width based on the available space? If you know of any wide or dynamic width templates, please let me know. This post is about Microsoft Debugging Tools for Windows, symbol servers, and symbol proxy servers. You can read my posts about this problem on the Microsoft WinDbg group, and on the Google Chromium group. We run several symbol servers, and a single symbol proxy server that provides transparent access to all our symbols servers, as well as the Microsoft symbol servers. I was debugging a Google Chrome crash, and was looking for symbols for Chrome. I was pleasantly surprised to find out that both Mozilla and Google have public debug symbol servers for Firefox and for Chrome. I added the Mozilla and Google symbol servers to our symbol proxy server list. The problem was that the symbols for Firefox or Chrome did not download as expected, but when pointing directly to the Firefox or Chrome symbol servers the symbols would download correctly. I captured network stack traces of the direct request and the proxy server request. We were running symproxy.dll version 6.8.4.0, and the latest release was 6.11.1.404. I upgraded the binaries to the latest version, hoping the problem would go away, instead the problem got worse. Now we were also unable to download symbols from the Microsoft’s own symbol server. Reading the MSDN documentation for SymSetOptions(), I noticed two options that could affect the observed behavior; SYMOPT_CASE_INSENSITIVE, and SYMOPT_FAVOR_COMPRESSED. I wanted to modify the symbol options while the symbol proxy was running, so I created an ISAPI filter DLL that will run in the same process space as the symbol proxy, allowing me to modify the symbol options. IIS calls GetFilterVersion() to initialize the filter, during this call I called SymSetOptions() and set SYMOPT_CASE_INSENSITIVE and SYMOPT_FAVOR_COMPRESSED. Calling SymSetOptions() had no effect, and I quickly realized that I am on the wrong track. SymSetOptions() is implemented by dbghelp.dll, while symproxy.dll does not load dbghelp.dll. A bit of investigation revealed that symproxy.dll loads symsrv.dll using LoadLibrary(), and uses only two exports; SymbolServerSetOptions() and SymbolServerByIndex(). I found documentation for SymbolServerSetOptions(), but nothing for SymbolServerByIndex(). But dbghelp.h did include the function prototypes for both functions. I changed my strategy, and decided to write a shim to sit between IIS and symproxy.dll, and another shim to sit between symproxy.dll and symsrv.dll. This approach would allow me to see all the values passing between the DLLs. I modified my ISAPI filter to also export SymbolServerSetOptions() and SymbolServerByIndex(). My DLL now effectively contained exports similar to symproxy.dll and symsrv.dll. The implementation of the exported functions called through to the real symproxy.dll and the real symsrv.dll. Since symproxy.dll loaded symsrv.dll using LoadLibrary(“symsrv.dll”) I had to name my DLL SymSrv.dll. To avoid DLL name confusion I renamed the original symproxy.dll to symproxy.orig.dll, and symsrv.dll to symsrv.orig.dll. My shim DLL was named SymSrv.dll, and implemented the symproxy.dll and symsrv.dll exports. I observed that the parameters being passed in to SymbolServerByIndex() are the symbol server, the file name, and an identifier. I also observed that the file name and identifier are present in the URL, but that by the time symproxy.dll calls SymbolServerByIndex() the parameters have all been made lowercase. Since I had access to the original path request, and I could intercept the call to SymbolServerByIndex(), I wrote code to replace the file name and identifier with the original cased versions. See the source code for details. This fixed the case problem and I was now able to retrieve symbols from the Mozilla and Firefox symbol servers. This did not however solve the problem with the Microsoft symbol servers. The problem turns out to be that the symbols on the Microsoft symbol server are compressed, and that the client would ask for the PDB file, get a 404, then ask for the compressed PD_ file, while the proxy would only ask for the PDB file, get a 404, and do nothing. By reverting symproxy.dll and symsrv.dll back to version 6.8.0.4, the symbol proxy worked again, first asking for the PDB, then asking for PD_, then decompressing the PD_ to PDB, and serving the PDB to the client. While looking at the meaning of the various options passed to SymbolServerSetOptions() I recalled that the MSDN documentation stated that the SSRVOPT_SERVICE option had been deprecated. I took a chance and modified my code to prevent the SSRVOPT_SERVICE option from being set. The result was that the symbol proxy now correctly retrieved compressed symbols. I now have a working symbol proxy that fixes the problems experienced with case sensitive web servers and compressed symbols. The source code is available here, normal disclaimers apply, use at your own risk. My solution is pretty much a hack, and since I do not have documentation for SymbolServerByIndex(), I assume there may be some use cases where my code will break. Microsoft has acknowledged the problem, and said they will fix the two problems in the next Debugging Tools for Windows release. Maybe one day Microsoft will make all their utilities open source allowing the community to fix problems instead of working around them.